Here's a photo taken on June 15. Is that a great red for the middle of June in the Baltimore-Washington, DC area! After most of your azaleas have finished blooming, Rainfire really lights up the yard. It also has attractive dark green foliage. The Harris hybrids tend to bloom in late midseason and have large flowers. They were hybridized by James Harris of Lawrenceville, Georgia. 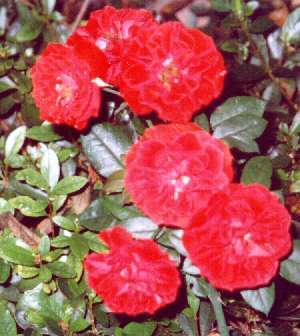 Here's a link to a photo of another Harris hybrid azalea, Miss Suzie. Miss Suzie is said to be a "strong red" but its color looks very different from Rainfire in these photographs.